This was indeed a bit hard to thing one. Was thinkin of doing something new in Quilling which i have not tried for a long time. my niece, Ananya 's name struck my mind .. her bday being in july .. so thought of gifting her my quilling work.So, why not her name in it? Then came the idea of making a Quilled Wall art with 'Ananya' name by including the Zentangle art into it. Zentangle is a new art to me, which i have been tryin to learn quite a few days. Its like a meditation,stress buster.Anyone can try .. its indeed a cool one. Now, about this Name frame.. The Entire art in 13" x13" card stock paper. I wanted to make it more pleasing to eyes, so chose Off white and gold as colours. Letters are of Gold,hand written and cut into shape and then quilled with off white colour.Added a gold background to make it more standout. The work is yet to be framed. Hope the whole work as come out good. Do visit http://indianquillingchallenge.blogspot.in/ to participate in the Challenge and win exciting prizes. Close up of Quilled Name. Close up of Quilled A.
I know its bit late to mention about this. I am happy to share that i have been selected as DT member in Indian Quilling Challenge grp in FB. This is my first exp as DT member. i was bit nervous whether i will be able to do justice to the post. But , Shylaa makes it easy and comes with simple challenges for me to do as DT member. Thanks to her. Challenges will be running for two weeks and as an inspiration i have to make the said project. 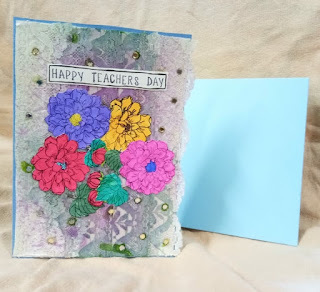 First Week Challenge - To make CAS card with Quilling. Second Challenge was to make Quilled Butterfly of any size.